The different models are distinguished by their lens & shutter specification. 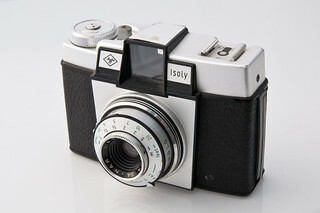 The Isoly Junior has a simple meniscus f/11 lens and a one-speed shutter; while the top model Isoly IIIa offers an f/3.5 Color Agnar lens in a Prontor shutter. The first in the Isoly series. 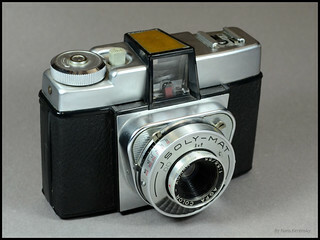 Basic with a 1:8 lens, 2-speed shutter and 2 hole apertues (8 and 11). Shutter : Everset type, speeds 1/30 and 1/100 sec. 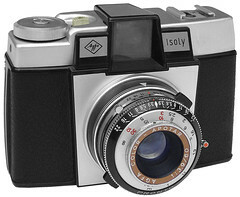 Although just named Isoly in its manual. This is the most basic model in the Isoly series. It offers a simple meniscus lens with 2 hole apertures (11 and 16) and a built-in close up range lens (2.5 to 5 meters). An Isoly with higher specifications. Shutter : Gauthier Pronto leaf shutter. 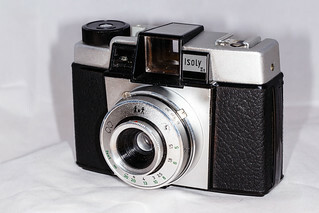 Marked and sold as Isoly III. 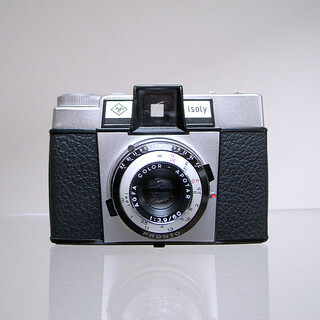 In fact this is the second model of the III with just another lens and shutter. Shutter : Gauthier Prontor 250 S leaf shutter. The Mat in the name refers to the automatic exposure control of the shutter. 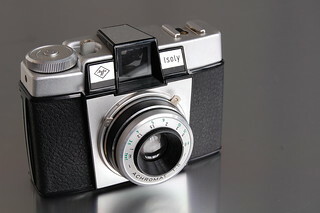 In automatic mode the diaphram opening is determined by the lightmeter. An indicator in the viewfinder shows if enough light is available (green) or not enough (red). In low light situations the shutter release is blocked (only in Auto mode). Production period : from 1962 onwards. Lens : Agfa Color-Agnar 1:5.6 55mm. Shutter : Leaf shutter with an automatic diaphragm control. Light measurement : Selenium cell underneath the lens. In Auto mode speed 1/70 sec. Automatic diaphragm 5.6 to 22. In Flash mode speed 1/30 sec. Manual diaphragm 5.6 to 22. 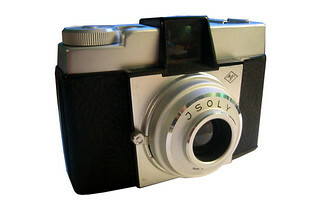 Film sensivity setting : 11 to 25 DIN, 10 to 250 ASA. Double exposure prevention : Yes. Flash synchronisation : Hotshoe on top, left. X-synchronisation. Günther Kadlubek & Rudolf Hillebrand, Agfa, Geschichte eines deutsches Weltunternehmens von 1867 bis 1997, Rudolf Hillebrand Verlag, 1997, ISBN 3-89506-169-7. This page was last edited on 6 July 2017, at 22:49.